“What a shocker… there’s ONE black person there and sure enough they have him standing right next to the mic like a manipulated prop. Way to go @SenatorTimScott. 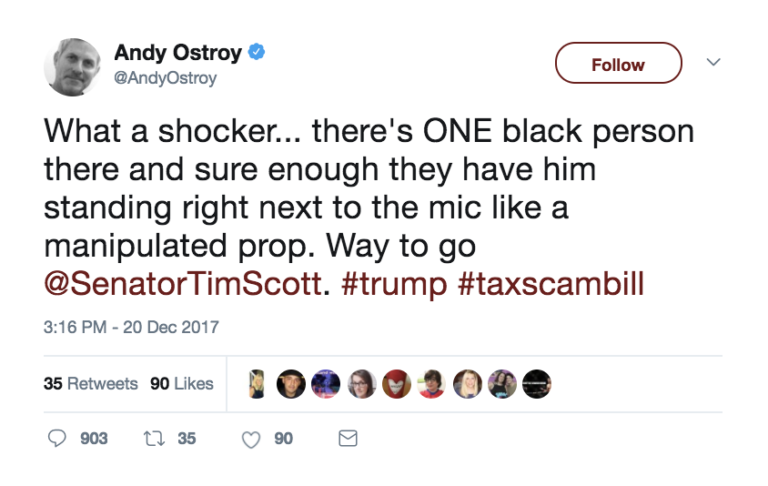 #trump#taxscambill — Andy Ostroy (@AndyOstroy) December 20, 2017.” Tim Scott didn’t hesitate… he smacked Ostroy… hard. Here’what he said, “Uh probably because I helped write the bill for the past year, have multiple provisions included, got multiple Senators on board over the last week and have worked on tax reform my entire time in Congress. But if you’d rather just see my skin color, pls feel free.” That is a killer response. Ostroy of course stood up on his hind feet saying that he shouldn’t be worried about him but rather the “party’s shafting today of minorities”: “Instead of worrying about me, perhaps @SenatorTimScott should be more concerned with his party’s shafting today of minorities, the poor & middle class…and of his shameless ongoing support of his sexist, admitted-sexual-abusing racist Machurian president who’s in bed w/ #Putin https://t.co/RXZsBhbK9I — Andy Ostroy (@AndyOstroy) December 20, 2017.” What an asshat and it’s ‘Manchurian’ you tool. Not long after, due to monstrous backlash on Twitter, Ostroy deleted his tweet and then apologized to Scott. “@SenatorTimScott, earlier I tweeted something that I now agree was unfair. Senator, I regret that tweet & apologize for it. There were many other ways I should’ve and could’ve made my point.” Scott didn’t bother answering him. 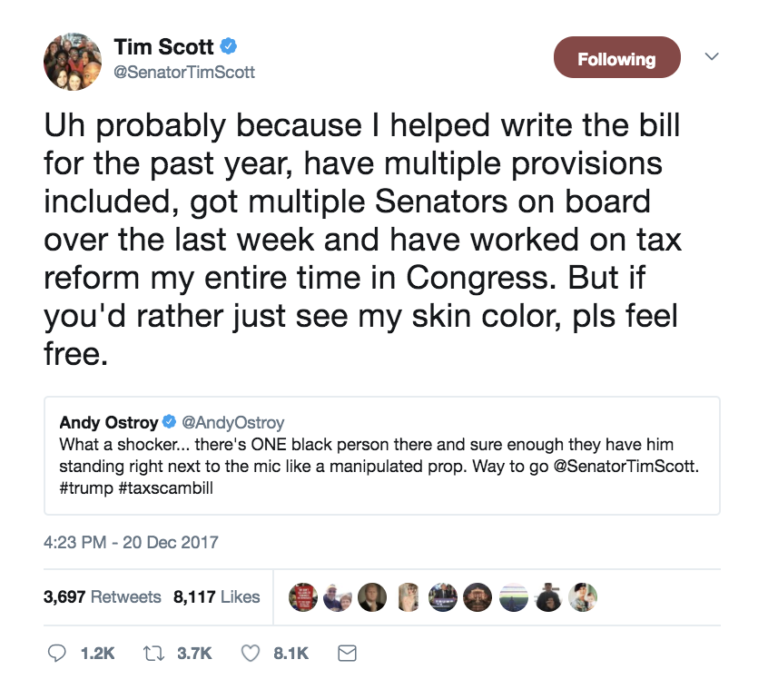 Scott earned his place beside the President, not because of his skin color, but because he worked night and day to get the legislation passed. Trump called on Scott to speak. “He came in and he would solve some problems when we weren’t looking too good a couple of times,” Trump said, looking at Scott. 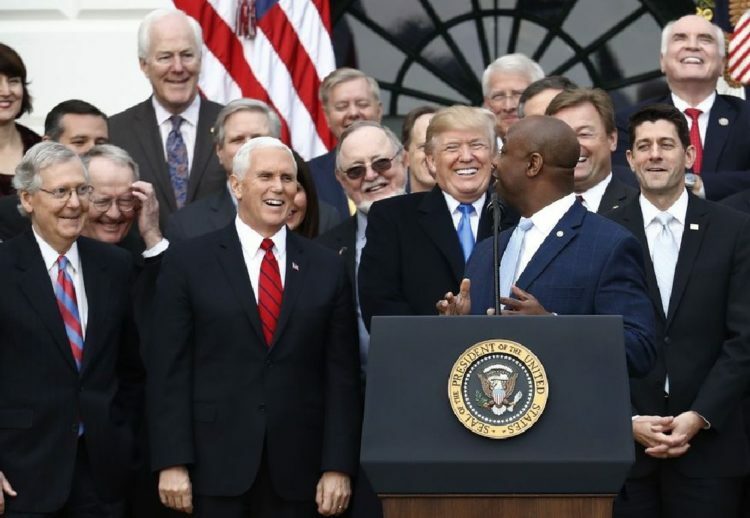 “Thank you, Tim.” Scott in return addressed the bill, “Let me say to those Americans who are watching this process, this is not about Washington,” Scott said. “It’s not about the left. It’s not about the right. It’s about single-parent moms who are looking for a reason to be hopeful in 2018. 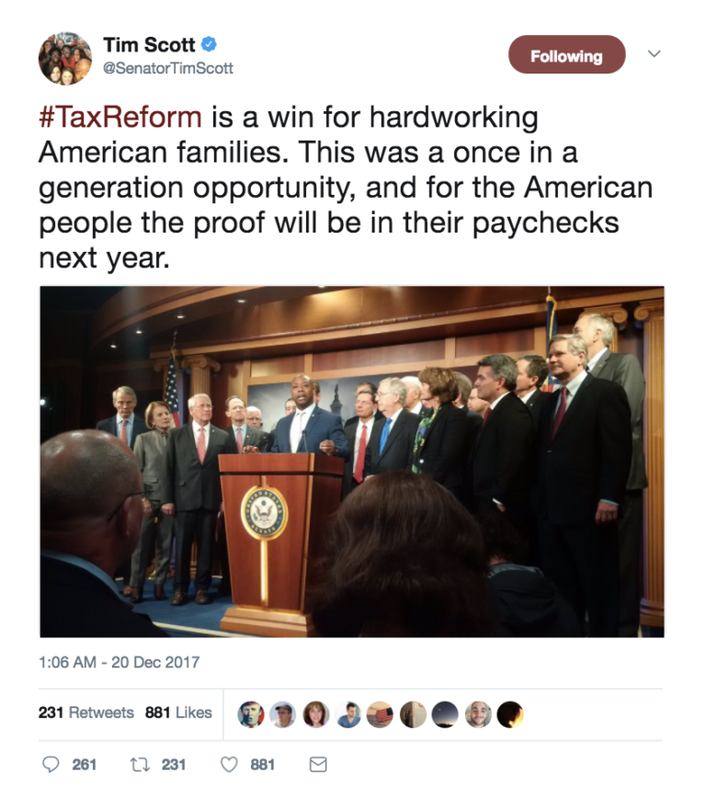 This tax reform plan delivers for the average single mother a 70 percent tax cut.” President Trump praised him as a “very, very special man” and said his contributions were invaluable to the passage of the tax bill. Scott was attacked by numerous leftist trolls online. But it did not phase him. He should be proud of what he just accomplished. Tim Scott is one of the greatest conservatives out there. 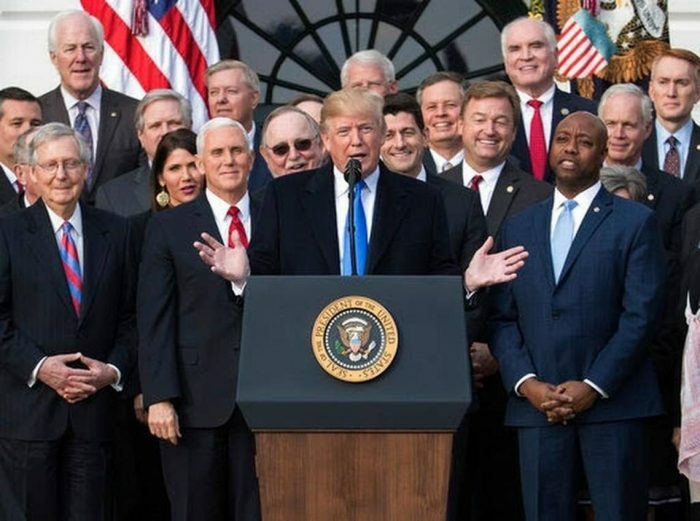 President Donald Trump joined by Senate Majority Leader Mitch McConnell of KY, Vice President Mike Pence, Speaker of the House Paul Ryan, R-WI, Sen. Tim Scott, R-SC, front right, and other members of Congress, speaks during an event on the South Lawn of the White House in Washington, Wednesday, Dec. 20, 2017, to acknowledge the final passage of tax overhaul legislation by Congress.